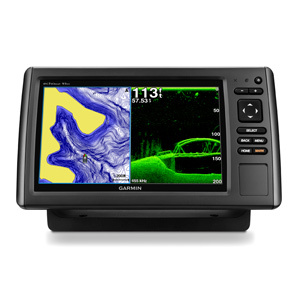 Garmin echoMAP 93sv has an average rating of 4 out of 5 based on 2 user reviews. Combining GPS with side-imaging sonar and detailed mapping, Garmin has created a fishfinder unmatched by any rivals in its price range. With the Garmin echoMAP 93sv, the challenge of guessing where the fish are is virtually at an end, and the fisherman can focus on the real sport of getting the fish to take the bait. The fishfinder itself has impressive measurements of nearly a foot wide by just over half a foot high and two inches thick. It’s needed to hold a high-resolution screen that’s nine inches. The screen is perfect for displaying images of both what’s beneath and what’s to either side in separate panels with sharp details. The screen also automatically brightens or dims the backlight level for optimal viewing at all times. The device provides a microSD slot to allow importing additional maps beyond the included 17,000 freshwater bodies contained in the LakeVu HD package. Two mounts for the 2.3 pound device are included – one swivels while the other provides a flush profile. Both make rapid installation and removal easy. The sonar data is supplied by a GT40 transducer that can be attached to the transom or a trolling motor. Using 500 watts, the GT40 transducer generates 77/200 kHz dual sonar beam for the widest amount of coverage. The DownVu technology provides an accurate picture of the underwater scene directly underneath the boat. Complimenting this feature is SideVu sonar which adds wide-angle viewing reaching up to 750 feet on either side of the craft. Together with HD-ID capabilities, these sonar beams operate in unison to create a comprehensive image with both side and overhead viewing angles of the fishing area on the screen that leaves no doubt about what’s going on below. Also, the sonar data can be stored and transferred to a computer for closer analysis with HomePort planning freeware. The Garmin echoMAP 93sv provides the LakeVu HD suite of freshwater maps. This feature offers 17,000 maps of the most popular lakes and rivers in the U.S. The competition doesn’t even come close to this number. 5,700 of these maps provide one foot contour resolution. The maps offer the option for the operator to enter a minimal depth setting to avoid areas and obstacles above the watercraft’s draft. The maps work with GPS tracking that reads the boat’s location five times a second to realistically portray its position on a given map at any time. If this isn’t enough, enhancement software like LakeVu HD Ultra, Bluechart g2, and Bluechart g2 Vision are available for sale on microSD card. The new 93sv is a very impressive fishfinder. Comparable side-imaging units with a 9 inch screen from Lowrance and Humminbird are much more expansive. This unit will be a very popular choice among those looking for a big screen and a complete set of sonar features. You can get a great deal on Garmin echoMAP 93sv here. I bought this to replace my Raymarine L365 Apelco which was a good unit except for the sub-par display. I went with the 93dv for the big screen and the included dual-frequency transducer. The SideVu and DownVu are bonus as well. Bright display and sharp detailed images – the level of contour detail is far better than what I was used to. Top notch GPS that is both fast and accurate – It locked onto 5 satellites and had the position fixed in less than a minute the first time I fired it up. Split-screen is great for the way I run dual-frequency side-by-side. One push waypoints are great. I love being able to mark a location from either the map or sounding screen with a single button. You can freeze the image on the screen with a click of the left arrow and run it back by holding it down. When you are done the back button resumes. The zoom works on any active screen using the + & – buttons. The select button lets you quickly alternate the active screen in side-by-side mode. The controls are very intuitive. It didn’t even take a whole morning for me to feel confident using this unit. The US LakeVu maps are nice and have pretty accurately defined shorelines and channels. Garmin should include model specific owner’s manuals. Having one manual for all the units leaves you with a lot of information to flip through that doesn’t concern your unit. The mount is horrible unless you have a nice level place to attach it. If you affix it to any kind of slope the unit will continually tip down when it is turned to either side. If you leave it centered up and down tilting work fine, but this limits where you can view it from by a lot. It would be nice to have some information about how much on board memory this thing has. I have no idea how much room there is for adding additional maps and storing data. My final verdict is that this unit is worth the investment. It is easy to use and does everything it is supposed to. The complaints I have are all things Garmin can easily fix. If you are in the market for a simple and robust fish finder/sonar this is a good choice. We have the Garmin EchoMap 94SV. I had it professionally installed. Noticed some very poor results with the SideVu. Later I realized the unit came with the wrong transducer. Garmin helped me resolve that. Did some adjusting and everything is great except the SideVu is a bit disappointing. I have been told it works really well for me but not on our unit. I have tried calling Garmin and had me change a few settings for SideVu. I finally got some decent mediocre results not what I was expecting. I like everything about the unit except the SideVu. We have a another manufacturers unit with side imaging and though it is hard to make out fish the detail is really good. So I think that is a lot of my disappointment expecting better. Garmin support has been very good. I sent some very poor Side Vu Screen Shots to Garmin support and got a message back “that’s working”. The mapping has worked flawless. Very good. The sharing of recorded maps is also good. Garmin has a website that you can download or upload shared maps people have recorded.